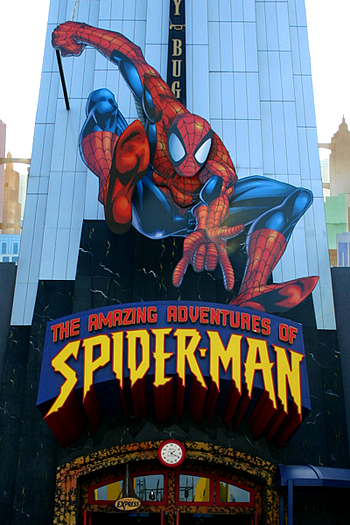 Several weeks ago I spent the better part of a day re-riding what I consider to be the second-best ride in Orlando, right behind the Haunted Mansion: The Amazing Adventures of Spider-Man at Islands of Adventure. This may come as a surprise to some of you and indeed had the 1990s not brought the end of Horizons, Journey into Imagination and World of Motion, it would probably be much lower on the list. In fact, Universal's brilliant Kongfrontation! would probably have knocked it several notches lower, but Kong met his end just a few years after Spidey began his crazy romp through New York, and to my eye Universal Creative has never bettered this dark ride. The problem is that until the last few weeks I've never really felt I had much to say about Spider-Man. Like Indiana Jones Adventure, it's greatness was so self-evident that there seemed little reason to either pick apart or defend its greatness. However, in mid-2012, Universal Hollywood opened a new take on the Spider-Man ride experience called Transformers: The Ride, an experience re-designed around a new franchise due to Universal's regional control of the Spider-Man character in theme parks. Transformers was such a huge success in Hollywood that Universal brought it over to Orlando, building and opening the east coast version in less than a year. I rode Transformers a lot in Hollywood, and again in Orlando. It's a great ride. But Spider-Man is better. So, we must ask the question: why? What about Spider-Man makes it inherently better? Looking at it simply on paper, Transformers has an edge in several respects. It's a crazier ride than Spider-Man, taking you directly into a war zone between giant robots. It's got better 3D effects and it makes better sense of some of the gags Spider-Man used. It has Optimus Prime thanking for for saving the world, and I don't care who you are, that's something everyone wants. Its use of flying effects is even more thrilling and convincing than Spider-Man. But it's missing something, too. First, let's look at Spider-Man alongside its flashy new sister, Transformers: The Ride. Although Spider-Man's 2012 visual upgrade has helped close the gap between the two rides in many respects, Spidey is still an intentionally cartoonier experience. I often decry tooniness in my articles, but it just works like gangbusters in Spider-Man. Spidey has an immediacy lacking from the usual take-you-inside-the-cartoon visual vocabulary employed successfully by, say, Roger Rabbit's Car-Toon Spin (which it vaguely resembles). Some of this can be attributed to Universal Creative's successful adaptation to the tone of comic books and pulp adventure serials: crazy action with a healthy seasoning of sarcasm. The villains in Spider-Man are absurd: instead of simply trying to kill you for discovering their secret hideout they take time to terrorize you with various objects (electrical plugs, pumpkin bombs, tongues) in a way that makes nearly no sense at all but adds to the sense of lighthearted menace. This same ride wouldn't work with Batman villains. Transformers, by contrast, almost takes itself too seriously - a trait inherited from the unfortunate Michael Bay movies. Even the fairly likable Transformer we ride in throughout the experience, Evac, could stand to develop a sense of humor. In the preshow video Evac reprimands us: "You can either thank or blame me later!" and on the ride mostly offers helpful advice like "We've gotta get you out of this city!" or "Reverse thrusters! Full power!" Evac: no Paul Frees, to be sure. The primary villain of Transformers, Megatron, admittedly not historically noted for being any fun, spends most of the ride playing Rodan to Optimus Prime's Godzilla while occasionally taking time out to swat at scaffolding or pull riders off a building. It's clear that Transformers expects us to take the Megatron threat fairly seriously, and the result is a bit less fun. If anything Transformers makes it clear that Megatron could kill all of the riders very easily, which somewhat undermines the credibility of his threat level when we miraculously survive every encounter. These Decepticons don't seem to be very good at what they do. Because Spider-Man's villains still behave according to the absurd established rules of comic books villains they, paradoxically, seem to pose more of a threat to riders. And speaking of that threat level, perhaps there's something to be said for rides where we, the riders, are intent on escaping a bad situation rather than charging forward into it. Theme park attractions from the very start have used the "something-goes-horribly-wrong" cliche, and perhaps the theme park default situation of eluding cackling witches, mummies, dinosaurs, snakes, and gorillas is so deeply ingrained that we respond to it warmly but unconsciously. Transformers makes us heroes in a war zone and instead of attempting to escape the Spidey villains we constantly, recklessly endanger ourselves inside Evac. This unconscious lineage perhaps makes is easier to feel invested, and thus alarmed in Spider-Man, which may contribute to the sense of its greater resonance. I think it's also fair to say that Transformers relies on screens much more than Spider-Man does, which is a difficult thing to try to quantify. Both attractions use 3D screens to drive their narrative, but I think the overall difference has to do with the kind of screens and their staging. 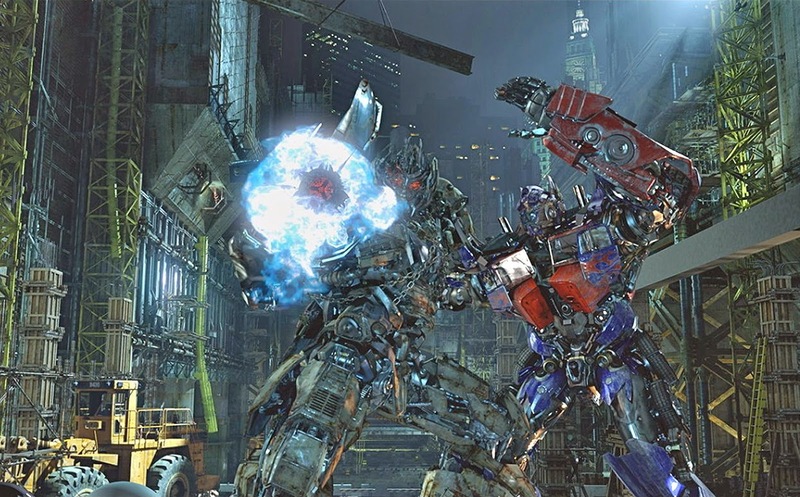 Transformers' screen-based scenes tend to involve simulated motion; you careen down a busy street, go through the belly of a robot, and fly sideways through a skyscraper. Spider-Man, largely, uses the 3D screens as extensions of sets to do things that can't be done with sets; exploding walls, endless warehouses, city landscapes. We could call this a "Cinerama" approach vs the "Virtual Back Wall" approach. There are exceptions, of course: Transformers' first few screens are indeed virtual rear walls and Spiderman in its last few minutes as the SCOOP ride vehicle careens through midair is practically entirely screen-based. Yet I think the fact that there is indeed a lot of set-based stuff in Spider-Man is what makes the difference, even if subconsciously. You can still take your glasses off in Spider-Man and still see plenty of stuff. Transformers is, essentially, a ride through CG action scene where I'm more comfortable calling Spider-Man a dark ride with 3D elements which do things normal rides can't do. Appropriately, Transformers is a far crazier ride experience. When Spider-Man was new it seemed that no ride would ever outdo it for hyperactivity, but both Harry Potter and the Forbidden Journey and Transformers are so crazily tightly paced that even modern audiences accustomed to the vomit-cam find them overstimulating. Along with Transformers' approximation of 2010's cinematic language, it comes with some unique moments which, to me, pose challenges to the "reality" of the theme park experience. Theme parks have always been predicated on the idea that crazy things are happening to you; you survive the burning building, escape the Haunted House, defeat the monster, dodge the rolling boulder. As a result most successful theme park attractions aim for a degree of realism, often manifest as detail. You feel as if you have been transported to exotic environments without the "mediating influence" of a camera lens or motion picture screen. "I learned this from Hobgoblin!" Transformers twice violates the "reality" of the theme park experience and emulates the movie experience, and while I can't say that the result "breaks" the illusion, it is a very odd, unique moment in theme park history. Twice the ride goes into slow motion - exactly as it would were we watching an actual Michael Bay movie in our local AMC multiplex. The action and sound slows down to allow us to register a crucial detail, before speeding back up. In others words, for a few moments we're no longer doing crazy things like we see in movies, we're doing things that only the motion picture camera can do. This is a new level of collusion between dimensional space and cinema space. Of course there's always been a number of Disney attractions which use not just film language, but film itself to carry an effect. Let's point accusing fingers at Soarin' Over California as Disney's most obvious offender here: we start off pretending we're going to be hang gliding (on a bench), but once we're up in the air - surprise! - it's a movie. And not only that, but it has dramatic music and editing which is central to the whole darn effect of the thing. Soarin' allows us to fly through a travelogue. There's no pretense that it's really an accurate hang gliding simulation. So it's not as if Universal is "guilty" of imposing cinema rules on its patrons while Disney is "innocent". But I must admit that the slow motion segments of Transformers trouble me, as a theme park partisan and as a cinema person, more than I expect they should. To me it seems that these brief segments (and they are brief, a couple seconds each) require us to make a conceptual leap about the limits of our own abilities than I'm unaccustomed to making in a theme park, which further contributes to my sense that the fairly straightforward Spider-Man is a better and more convincing experience. Let's start digging a bit deeper into The Amazing Adventures of Spider-Man, and I'd like to begin by talking about its queue. Islands of Adventure largely has superb queues, and with the addition of Harry Potter and the Forbidden Journey is probably the best theme park in the United States for narrative queueing experiences, but it's important here to discuss exactly what having a "great queue" entails. I think the rubric for a great queue is a sliding scale relative to the value and duration of the ride which follows it, and the reason is because an elaborate queue unconsciously signals to a prospective rider that the ride which follows will be a special experience. A simple or crudely themed ride preceded by an elaborate queue will be perceived as a letdown, whereas the best queues link up harmoniously with the ride experience to create a true "first act". Indiana Jones Adventure and Forbidden Journey are two of the biggest, craziest rides ever, so their elaborate queues feel justified. The Little Mermaid ride at Magic Kingdom has a gorgeous facade and queue - better than the ride which follows, in fact. I've spoken to many tourists who felt let down by Mermaid because the queue set them up for an experience far better than the ride delivered. So clearly there is such a thing as "too elaborate a queue". I think Spider-Man hits the sweet spot exactly. On first blush there isn't too much to it - especially compared to richly textural experiences like the Tower of Terror, but looks are deceiving at Spider-Man. To my eye, this queue is the only area of the "island" the attraction is situated in - Marvel Super Hero Island - where the conceit of "being in a comic book" is successfully carried off. There's a simplicity and directness to the visual treatment of this idea - the slightly weird, flat false doors, exaggerated perspectives, and monochromatic background "details" which convincingly fills in enough of the Daily Bugle to make it seem like a real functioning place while guiding the eye towards the queue video which should be the centerpiece of the experience. Queue videos are something of a dirty idea in Disney circles - just about the best thing I can say about Everest, for example, is that its queue sets up the ride on visuals alone - but overhead videos are a Universal tradition and Universal is especially good at creating them. The reason why Universal rides often (but not always) benefit from queue videos is because of Universal Creative's much more ambitious use of narrative in its attractions. Disney and Walt Disney Imagineering spill a lot of digital ink about the "storytelling" of their attractions in promotional materials, but the fact is that Disney is just not very good at it. Disney theme park stories tend to break down into two categories of narrative: book report attractions and experiential narratives. Book report attractions are best typified by the new Little Mermaid dark ride at California Adventure and Magic Kingdom, which rely on a sense of participation and closure through familiarity with pop culture texts. Experiential attractions, which can have varying degrees of narrative involvement, are about experiences and places which happen to you as you travel through them, fabricating a new narrative as it unfolds about your experiences. Think of the Jungle Cruise, which can be said to be a story about our experiences in the jungle. Most Disney attractions can be located somewhere on a line that stretches between these two poles. But when it comes down to the nitty gritty, Disney doesn't tell stories so much as set up situations and build environments, which is a different thing. This is why it's hard to quantify what Disney does so well using the limiting word "story", because most of the actual narrative experiences boil down to "you saw some weird things", or "we went fast". Universal, on the other hand, has maintained more visible roots as a product of a motion picture company. 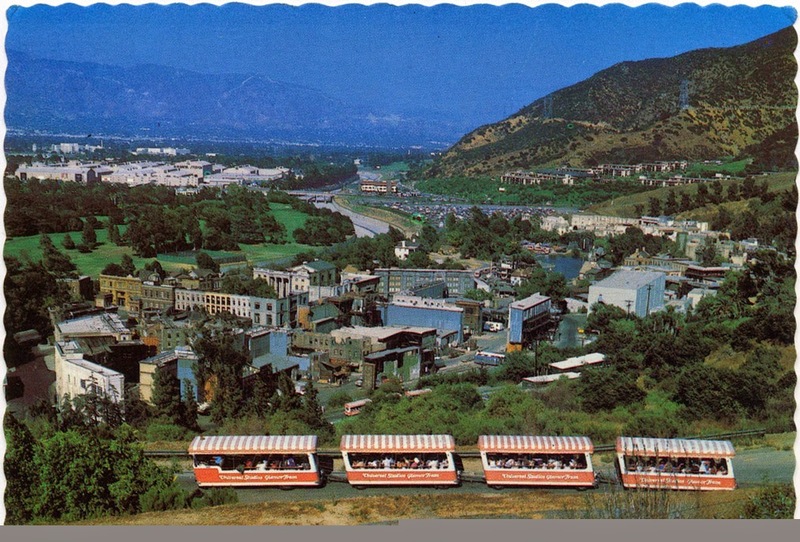 Their California attraction is less a theme park than a movie studio tour that also has some rides. The vast majority of their attractions are based on some existing property and narrative. They are far more likely to use the "silver screen" as the dominant feature of their attractions. And in a way that Disney largely moved away from in defining their "house style" in the 1950s and 1960s, Universal is far more wed to the ongoing narrative structures of the Institutionalized Mode of Representation in American mainstream film. It is, after all, a production studio. Universal attractions use their queueing spaces to set up locations, characters, and ideas which you are then expected to mentally track as you move through the attraction to be able to make any sense of what happens. Some Universal attractions use Hitchcock's beloved "MacGuffin" to drive their events - the Allspark in Transformers, E.T. 's flight home, an ancient curse in The Mummy. If you don't pay attention to what's being said in the various preshow rooms of Harry Potter and the Forbidden Journey, then the experience makes literally no sense (to be fair, it only barely makes sense if you do). Look at the Men in Black attraction at Universal Studios Florida. 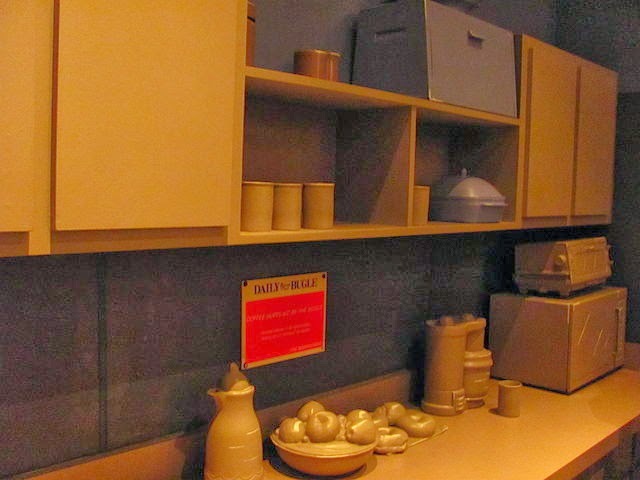 Taking a cue from the film, it presents itself as a remnant of the 1964 New York World's Fair, drawing on the theme park audience's familiarity with the Carousel of Progress at Magic Kingdom. The introductory room is a ludicrous dusty ugly jumble of stained glass panels complete with a fake attraction entrance to "The Universe and You". As the Sherman Brothers-esque soundtrack swells, then breaks, the attraction is revealed to be a front for a MIB training facility. After an appropriately crazy adventure battling aliens, our memory is "wiped" and the cars return to an unload station... for the fictional "Universe and You" attraction, advocating the idea that aliens, in fact, do not exist. 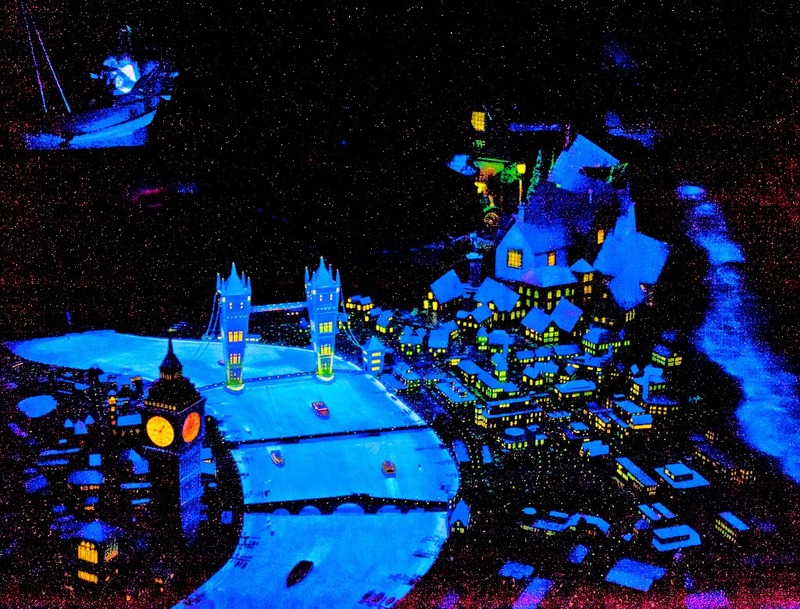 This is all very clever but does not even overshadow or overlap the ride itself, which greatly bests WDI's efforts to create a "ride-thru shooting gallery" attraction. But you can miss the whole thing if you didn't pay attention in the queue and foyer areas. Spider-Man hits a sweet spot in this case as a great deal of the concepts conveyed in the pre-show are the sort of "narrative housekeeping" that plagues all theme park attractions of its era: the danger of the situation, why "tourists" would be allowed to do this, etc. But the main plot points are conveyed time and again on screen after screen: a group of Super Villains have a green levitation ray and have ransomed the Statue of Liberty. Everything else we need to know is conveyed on the attraction's marquee. And as for the always-finicky plot point of sending "wet behind the ears tourists" into the seat of danger, Spider-Man here has use of the anti-heroic, absurd J. Jonah Jameson, and his actions are actually in character. We may wonder if Buzz Lightyear would send a group of new recruits into battle against Zurg, but for Jameson it's just another day at the office. Much of the entertainment value generated in the queue comes from the dissonance between his absurd bluster and the obvious danger riders are placed in; at one point he's even seen placing a call for another group of tourists! I find the rest of the queue to be uncommonly carefully thought out. 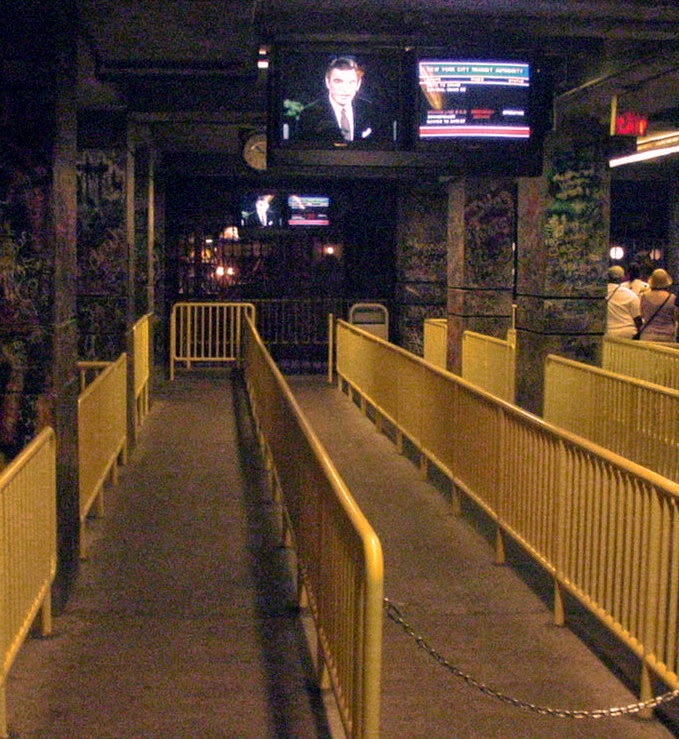 Ordinarily the "overhead TV screens" method of storytelling grates against the basic situation presented in a theme park, where it rarely makes sense that so many televisions would appear in such an area. Would NEST have quite so many built in video screens as they seem to? 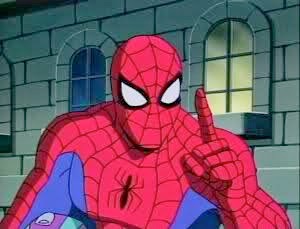 But if there's any place where constant narration and visual input of events happening just outside the building in a danger zone make any sense, it's in a news room, and that's where Spider-Man puts us. Spidey also plays some fun tricks with the state of the Spider-Man "franchise" circa 1999. The queue itself is presented in an elaborated version of the flat facade style of the rest of Marvel Superhero Island, an aesthetic more or less invented (fairly unsuccessfully, let's owe up to it) for the area. The ride itself however has always been presented in a unique CGI look which to me fairly successfully bridges the gap between a flat drawn image and what we would expect to see if we were actually confronted by these comic book characters. In between comes the cartoon. The queue videos are presented in the style of what was then the dominant method most American kids would've been exposed to Spider-Man: through the Saturday morning cartoon. 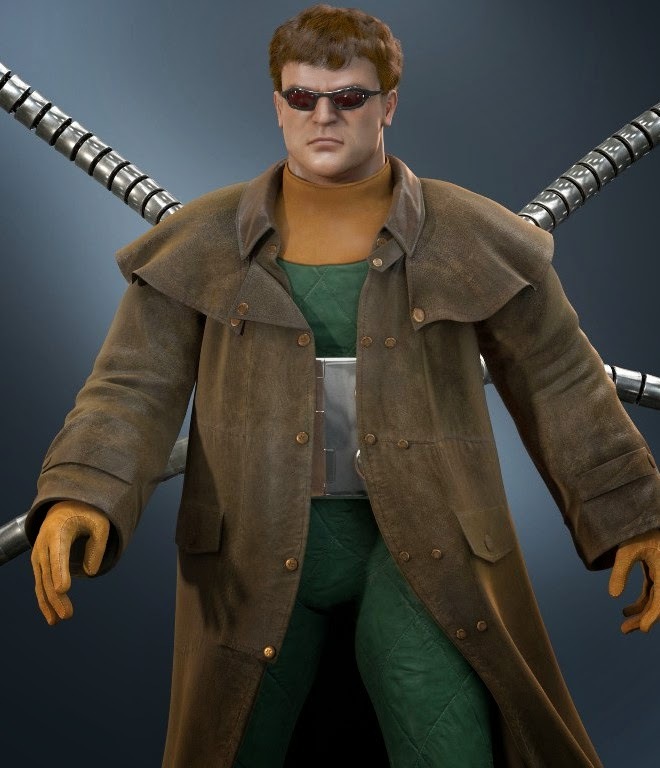 In 1999, this is how we would've expected Spider-Man to look. Because all we see of Spider-Man until he lands on the hood of the SCOOP is through a TV screen, of course he looks the same as he did on TV. 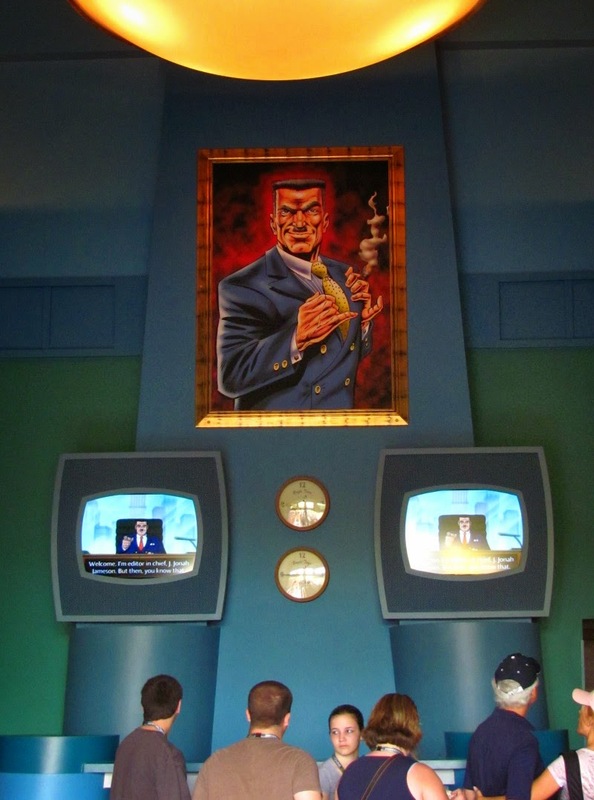 When we see drawings of Spider-Man or J. Jonah Jameson in the queue or on the ride, they're drawn in what was then the modern Marvel comic book style, befitting representations of characters in 2D media. The Amazing Adventures of Spider-Man rallies all of these media representations of the same character as a way of preparing us for very aggressive encounters with them in the more immediate environment of the dark ride. All of the "faces" of Spider-Man collapse into one face when we finally come nose-to-nose with him. 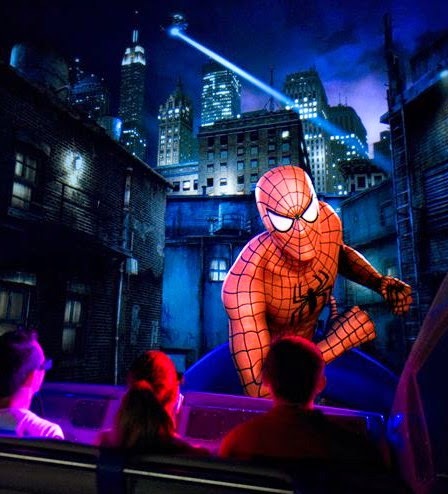 Spider-Man's meta-textuality is clever and sets it apart not only from everything else in Islands of Adventure, but practically all of the other "enter a fictional world" attractions. It creates a unique Spider-Man that's related and complimentary to but not identical to any other Spider-Man experience; in this way it's fortunate that Universal got this ride built before the motion picture adaptations began to roll out in 2002. 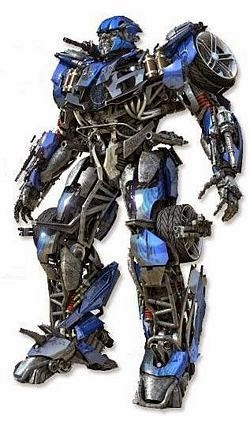 Transformers is greatly hampered by being wed to the style and association with the Michael Bay movies which inspired it, although Universal Creative did go to great lengths to make the ride comprehensible to those only versed in the 80's cartoon. Transformers is still affected and informed by a specific source material in a way that Spider-Man escapes. This may account for the increasing sense that Spider-Man is a more timeless ride experience. What is it that makes a ride timeless over any of the other exhibits and rattle-around trips that drift through theme and amusement parks over the decades? After all, at first it's hard to tell. Haunted Mansion was met with mediocre reviews, Space Mountain and Indiana Jones Adventure caused enough injuries to require modifications, Back to the Future and Jaws broke down constantly, and Forbidden Journey courted controversy with restrictive seats and over-the-top intensity. At the time it seemed like these public dramas would never go away, but time heals all wounds. What is it that makes a theme park ride a lasting classic as opposed to an attraction of its time? Or, to turn it around, what makes a ride last longer than, say, a popular film? When it was new the big selling point of Spider-Man was the fact that it was in 3D, but 3D is no longer the selling point it was and the lines continue. We can watch 3D movies at home now if we wish but the market for that product has been steadily imploding. I think the thing that the great classic theme park experiences provide doesn't have a lot to do with the property or the concept or even the details, since time and again those have shown to be variable and open to endless interpretation and variation: it has to do with providing the concept of a "pleasurable illusion". It isn't that it's a convincing illusion, although it can be, as in the Hall of Presidents. It's that it has to only be convincing enough for us to suspend our belief and pretend we're fooled. Momentarily, our adult credulity dissolves and we fly over London, or with Harry Potter, or slip amongst pirates unnoticed. The intense emotional reaction that sometimes results is as much from the attraction as it is our recognition and joy at feeling unburdened of rational doubt. We know very well we're not actually flying over London, but we want to feel that we are, and we cry. Spider-Man is the best example of this dynamic in the Universal canon. We know very well that we're looking at 3D images on huge screens but our awareness of this only heightens our appreciation for the cleverness of the effect. This makes the effects into a sort of mental game, and so when those pleasurable illusions defy our expectations in noticeable accumulations of details the result reinforces and flatters our attention. In a way, The Amazing Adventures of Spider-Man gets better the more attention you pay to the details that reinforce the "pleasurable illusion". There's the initial projections that create the shadows of scuttling rats or Spidey swinging on the rooftops above us, not 3D projections but ones that extend and reveal space. 3D characters frequently appear to "stand" on dimensional set pieces, to the extent that some riders think there's more screens in the ride than there are. There's fairly complex spatial cues which go by nearly unnoticed but reveal the extent of the care that went into the conception of the ride. At the start of the ride, Electro notices riders and leaps up onto a catwalk; the cars race under the catwalk to escape. Listen and you'll hear Electro running above the car before he drops down in front to threaten the SCOOP with a high power cable. That's the sort of easy to miss detail that is highly fetishized in Disney circles. The greatest scene in Spider-Man, where the "pleasurable illusions" are at their most convincing, is the Hobgoblin vignette where the flying villain lobs pumpkin bombs at riders. Thanks to careful considerations of perspective and set design, one of the bombs appears to detonate into the support structure of a bridge, resulting in an actual explosion as the bridge begins to collapse on top of riders. The gag is masterpiece of timing and design, and with nowhere else to go from there, the ride immediately proceeds to its aerial climax. This is why, fifteen years later, there's nothing quite as great as Spidey landing on the hood of our attraction vehicle to warn us, not even the similar moment in Transformers. It's one of those things that seminally breaks the rules of theme park attractions, like seating ghosts beside us or sending our boat unexpectedly backwards. You can only break a rule once, and so Spider-Man immediately sets us up to expect a new and exciting experience. It doesn't let us down. The ride is a masterpiece. I put "Expedition Everest" in the category of "the queue is better than the attraction." Thanks for putting into better words then I ever could how I have felt about Spiderman since my first ride in 1999. Universal and Disney have yet to raise the bar, even with the newer efforts you mention. ..And thanks for a Universal post. Great post! I maintain that Spiderman is one of the best theme park attractions that I've ever ridden. I last rode it in 2012 before the upgrade, and it was still great fun. The queue also does an excellent job in setting up the story and has some nice gags. I'm curious to see how Transformers stacks up, though I expect that it isn't as incredible. Excellent insights, gave me a lot to think about! You should be designing rides. Absolutely spot-on. I'm not convinced its the second best ride ever, but I'm really happy to finally see some critical analysis of what Universal does right. I'm a completely bi-themepark lover and I find it unfortunate that only Disney seems to get the critical eye from awesome writers like you. One part of this piece that I love is the "book report" rides at Disney. I find Little Mermaid to be exceedingly badly done for many things, but mostly it's the totally inexplicably brief story it tells. It's like randomly watching 5 second clips of the movie, with very little context. The primary element of the movie, that she loses her voice, isn't even really covered in the ride, but its effects are. My WED friends talk about story telling, but you are bang-on when you say it's actually Universal that tells more fully fleshed-out stories. No disrespect to Disney, as clearly it gets the respect it deserves. But, it's rare to read something that actually focuses on some of the high quality work done at Universal. Thanks! Thanks all for your responses! Hampton, spider-Man definately isn't the second best ride of all time, just the second best currently operating in Orlando. ;) As you probably know, my all-time favorite is Pirates at Disneyland. While I'd put Tower of Terror No. 2, then Spider-Man, and give strong consideration to Splash Mountain ahead of it as well, I think it's a perfectly acceptable choice in the slot. Thank you so much for this article. Sincerely. Few things make me happier than someone putting wonderful words to feelings I share but can't articulate. I've been reading and enjoying your posts for a while now. I'm especially fond of the exploration of story-telling through design with Pirates and our beloved Mansion. My love for Spider-Man came during IOA's early years (again, completely agree if the original Journey Into Imagination with Dreamfinder had not been so thoughtlessly butchered, it would prove strong competition). I found myself believing at the time that Universal was doing Disney better than Disney was doing Disney. Things have changed since then, as they do, but I think Spidey has withstood the test of time this far. I know Universal isn't exactly your wheelhouse, but I appreciate your insight, and now that you've mentioned it, I would love to read what you think made Kongfrontation such a masterpiece. Thanks for sharing your passion! Excellent break down of a classic attraction. Very insightful! Spidey is one of my favorites and Transformers isn't far down the list. As a dark ride designer, I am very glad to see someone paying attention to the psychology that goes into taking guests into a story. It is not an easy task, but when done well can be an amazing experience.